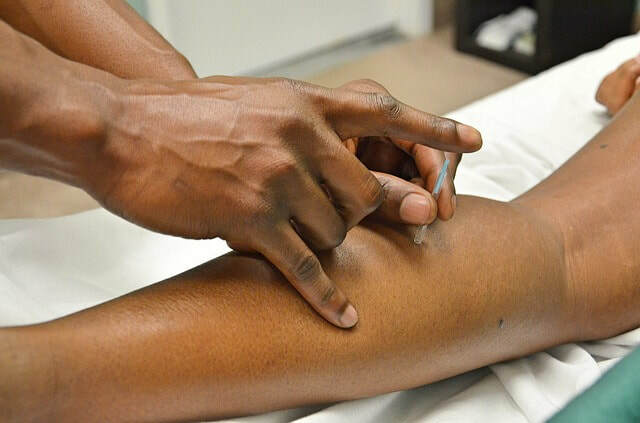 Dry Needling, also referred to as Intramuscular Stimulation (IMS), is a technique used to reduce muscle tension and quickly and effectively treat muscular pain. To do this, a thin, sterile needle is inserted through the skin into specific areas within a tight muscle known as trigger points. A trigger point is a taut, wound up knot within a muscle. These can sometimes be easily identified as they can be tender to the touch. By gently stimulating these areas with the needle, they can be released in order to relieve pain, decrease muscle tension, increase flexibility, and improve range of motion. To put it simply, dry needling is a very unique sensation. Since the needle itself is extremely thin, it is often not felt at all. Most of the sensation resulting from dry needling originates from the muscle itself reacting to the technique. As the needle encounters trigger points within the muscle, a "twitch" response may be elicited. This response may feel like a quick, sudden burst of electricity in the muscle. Though the process of dry needling can be uncomfortable, you will always be in control. If you choose to stop or require a break, simply ask your physiotherapist. Luckily, dry needling is a quick and effective process, taking only approximately 10-15 seconds to complete a location. Our therapists who use dry needling as a technique are properly trained and rostered (certified) to perform the technique. As such, they are trained to perform dry needling safely and with sterile technique. New sterile and disposable one time use needles are used every time. The most common side effect from dry needling is mild soreness following the procedure, lasting up to 24 hours. On occasion, a small, dime to nickel-sized bruise can also appear following dry needling. Different points in the body may carry their own potential risks. Your physiotherapist will go over any of these risks with you before receiving your consent to continue.